NEW YORK (Reuters) - Harry Houdini's great-nephew said on Friday he will seek permission next week to have the legendary escape artist's body exhumed from a New York cemetery and tested for evidence he was murdered. George Hardeen told reporters he became interested in the circumstances surrounding Houdini's death in 1926 after publication of a book last year that said the magician's enemies may have poisoned him. "His death shocked the entire nation, if not the world. Now maybe it's time to take a second look," Hardeen, believed to be Houdini's closest living relative, said by telephone from Arizona. Few performers have ever captured the public imagination like Harry Houdini. From his breakthrough in 1899 to his death in 1926, Houdini was one of the world's most popular entertainers, a true star of stage and screen. Time and again, his escapes from seemingly impossible predicaments thrilled audiences, who found in him a metaphor for their own lives, an affirmation of the human capacity to overcome adversity. Escapism in both senses of the word. But while nearly everyone is familiar with Houdini's stage persona, his little-known personal life is equally revealing. Taken as a whole, the public and private views make "The Elusive American" a uniquely powerful window on his times. His love of America was such that he always claimed Appleton, Wisconsin, as his birthplace. But the man known as Houdini was actually born Ehrich Weiss in Budapest, Hungary. He would not arrive in Wisconsin until four years later, when he, his mother Cecelia, and four brothers joined his father, who had become rabbi of a small Reform congregation there. Although an educated man, Herman Mayer Weiss (Weisz was changed to Weiss courtesy of immigration officials) was not destined for success in America. His life-long struggle to provide for his family would make a lasting impression on his son "Ehrie," who was forced to work from an early age to help make ends meet. Still, the boy was drawn to performing, making his debut in a neighborhood circus as the nine year old trapeze artist, "Ehrich, The Prince of the Air." In 1887, after a series of failed rabbinic appointments in the Midwest, Herman Mayer Weiss brought young Ehrich with him to New York, where they lived in a boardinghouse and found what work they could. When he wasn't working, Ehrich excelled in sports, particularly swimming, boxing, and running, developing the natural athletic gifts which would be vital to his future act. He also rediscovered a childhood interest in magic, and in 1891 teamed up with a friend named Jacob Hyman in an act they called "The Brothers Houdini." After his hard-luck father died in 1892, eighteen year old Ehrich left his mother and brothers in New York and took to the road. The Brothers Houdini performed their act -- an unremarkable collection of card and other magic tricks -- in dime museums and small theaters throughout upstate New York and the Midwest. They performed on the Midway of the remarkable 1893 World's Columbia Exposition in Chicago. In 1894 Harry's younger brother Dash replaced Hyman, but not for long. That summer, Harry met and married a fellow performer, a petite eighteen year old from Brooklyn named Wilhelmina Beatrice Rahner. "Bess" was made Harry's assistant, and the Brothers Houdini became simply, "The Houdinis." While they gained some notice with a trunk escape they called "The Metamorphosis," life on the dime museum circuit was grueling for the young couple. Though barely twenty-five, in 1898 Houdini was so tired of it he thought seriously about quitting, and even sent out a catalogue for "Harry Houdini's School of Magic" while staying with his mother in New York on an extended break. But he and Bess went back on the road, and in the spring of 1899 Houdini finally caught his big break. The reversal of fortune came when Martin Beck, a rising tycoon in the new world of vaudeville theater, saw the Houdinis in a beergarden in St. Paul, Minnesota. 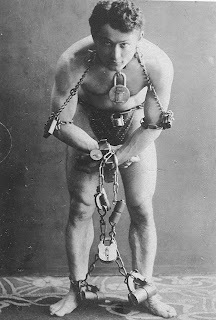 Ignoring the rest of the act, Beck saw something in Houdini's handcuff escapes, and challenged him the next day with his own cuffs; Houdini escaped easily. A few days later, Beck -- who was with the Orpheum circuit which dominated vaudeville in the West -- cabled Houdini from Chicago: "You can open Omaha March twenty sixth sixty dollars, will see act probably make you proposition for all next season." As Houdini later wrote, "This wire changed my whole Life's journey." By the end of the year, Beck had the Houdinis playing in leading vaudeville houses from the Midwest to California; by early 1900, they were also a hit on Keith's East Coast circuit. 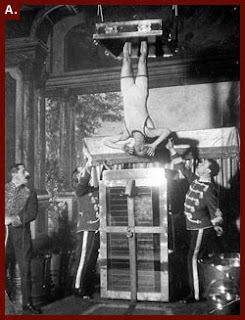 Displaying a talent for publicity to match his abilities as an escape artist, Houdini performed jail escapes and other public stunts to lure people into theatres. Houdini, known variously as "The Celebrated Police Baffler," "The King of Handcuffs," and a host of other names, developed the basic routines which would make him a legend. After nearly a decade playing dime museums and circuses, vaudeville must have seemed like a different world. The Houdinis performed fewer shows -- before upscale audiences in lavishly appointed theaters -- and made far more money. At the turn of the century, vaudeville was the top of the entertainment pyramid, and Harry Houdini became one of its stars. But as wonderful as this was, no amount of success in America, which had barely begun to emerge from Europe's cultural shadow, could compare with acceptance across the Atlantic. Already bickering with Beck, he arranged his own tour of Europe, where he would spend the bulk of the next five years. Tirelessly crisscrossing the continent and British Isles, Houdini delighted crowds just as he had in America. He also continued the practice of staging public exhibitions and taking challenges. One such memorable challenge came from the London Mirror newspaper, which commissioned a special set of handcuffs for Houdini. After more than an hour -- and several theatrical flourishes -- Houdini emerged free of the "Mirror Cuffs," setting off pandemonium in the music hall. In Germany, he caused an even bigger stir when he ran up against the Kaiser's formidable police force. When a Cologne policeman accused him of fraud, Houdini charged him with slander rather than backing down. Even though he had to reveal some of his tricks to the court in order to prevail, the resulting windfall of publicity only reinforced his status as Germany's "König der Handschellen." After conquering Europe, Houdini returned to America in 1905 and put down roots, buying a small farm in Connecticut and a stately brownstone in Manhattan. Although being an entertainer meant constant travel, the brownstone became home base for his family, particularly Cecelia Weiss. Houdini had always been close to his mother, but since his father's death had demonstrated a fierce devotion rivaled only by his love for Bess. When word of her death reached him in Sweden in 1913, he reportedly fainted, then wept uncontrollably when he came to. "I am what would be called a Mothers-boy," admitted the man hailed around the world as a real-life superman. He would grieve for her the rest of his life. This devotion, along with a fierce desire to succeed as his father never had, led Houdini to drive himself relentlessly, and helps account for his incredible career. When others would have retired to enjoy their success, Houdini reinvented himself time and again, finding new ways to maintain his public appeal. In 1908 he introduced the famous milk can escape, reminding audiences that "Failure Means a Drowning Death." Around the same time, he staged a series of "manacled bridge jumps" which drew large crowds and a great deal of publicity. In 1913, he added the elaborate Chinese Water Torture Cell escape, which he usually referred to as "the Upside Down." Some consider it Houdini's greatest trick, and it certainly had all the elements of a Houdini performance: brilliant technical conception, great physical strength, and highly dramatic presentation. After almost three decades of public performances, Houdini eventually found a new and powerful way to reach people: the motion picture. He made his first film, a serial called "The Master Mystery," in 1918, just as the movie business was about to take off. Although his acting was wooden and screen magic held none of the mystery of live magic, Houdini became one of Hollywood's first action heroes, and his movies delighted audiences around the world. Now in his mid-forties and physically worn-out, he was thrilled to be able to perform an escape once and have it preserved forever. And in typical fashion, Houdini jumped into the new medium with both feet: not content just being a star, he started his own production company and several other movie-related ventures, all of which lost money. Another great passion of Houdini's emerged in the early '20s, when he became a leading critic of the Spiritualist movement sweeping Europe and America in the wake of World War I. Perhaps embarrassed by his lack of formal education, Houdini had always worked hard to educate himself; his great passion was the history of magic, and he amassed one of the greatest collections of such material in the world. Thus when Spiritualist mediums gained considerable attention by claiming to be in touch with the spirit world, the world's most famous illusionist felt compelled to reveal them for what they were: highly skilled performers. Houdini's crusade, which he approached with characteristic passion, led to two particularly revealing episodes. One was his friendship with English author Sir Arthur Conan Doyle, a leading advocate of Spiritualism. Although Houdini was eager to remain friends with the noted man of letters, their differing views eventually led to a falling out. The other episode was his very public battle with the most noted medium of the day, Mina Crandon, a.k.a. "Margery," the wife of a prominent Boston surgeon. As part of a committee organized by "Scientific American" magazine, Houdini helped expose Margery as a fraud after a series of combative seances. He even published a forty-page illustrated pamphlet entitled "Houdini Exposes the tricks used by the Boston Medium 'Margery'" at his own expense. As generous as he was with family and friends, Houdini made an implacable foe. Houdini began 1926 on a high note, reaching the height of success with his own one-man show on Broadway. The two and a half hour "HOUDINI" featured a bit of everything that had made him a legend since the dime museum days: small-scale illusions, blockbuster escapes, and a Spiritualism expose. The show was such a success he took it on the road. But during a stay in Montreal in October, Houdini was assaulted by a young man in his dressing room. The stomach blows -- which he had invited as a test of his legendary strength -- aggravated a case of appendicitis, and he soon became seriously ill. In a final display of stamina and willpower, Houdini performed the next day and again in Detroit. His appendix was removed on October 25th, but the delay had allowed an infection to set in, and he died in Detroit on Halloween. Banner headlines, long obituaries, and a crowded public funeral in New York marked Houdini's passing. These were but a few of the signs that the world knew it had lost one of the most original and beloved entertainers of all time.